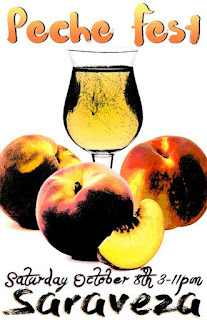 9/7/2016 Portland, OR - ‘Peche Fest’—Oregon’s only festival dedicated to drinking the world’s greatest fruit—the peach—returns for its 4th year on Saturday, October 8, at Saraveza and the Bad Habit Room. Nature's finest creation the Peach will be on tasty display with tart, fuzzy, juicy peachy goodness with 25+ beers and ciders from sweet, funky to sour and barrel-aged. As usual there will be a special food menu of sweet and savory items made with peaches. Both General Admission tickets (3-10pm) and special limited VIP session (1-3pm, limited to 50) tickets are now on sale. This years lineup of rare and tongue tantalizing Peach beers might be the best yet. From annual classics like Upright Brewing’s Fantasia and Logsdon’s Peche ‘n Brett to new buzz-worthy beers like Almanac's Peach de Brettaville, Block 15's Peach Pit Wit, De Garde's Imperial Stone Bu and even new peachy debuts by breweries like Great Notion and Deschutes. The full beer and cider list will be released in the next few weeks. Also participating: Holy Mountain Brewing, Hair of the Dog, pFriem Family Brewers, Double Mountain, Hopworks Urban Brewery, Fort George, Bend Brewing, Solera, Golden Valley, 10 Barrel, Oakshire, Cascade, Great Divide, Ex Novo, 2 Towns Cider & more tba. Returning this year is the VIP session from 1pm to 3pm, featuring first dibs at some of the rarest beers, extra drink tickets, and entry to Saraveza two hours before the main session. General Admission entry begins at 3pm for both Saraveza and the Bad Habit Room and is $10 for a commemorative glass and 2 drink tickets. Most beers will be one drink ticket per pour with additional drink tickets available for $2 each. Advanced tickets available now! VIP HOUR(s): 1pm to 3pm in Saraveza only. Advanced tix only.